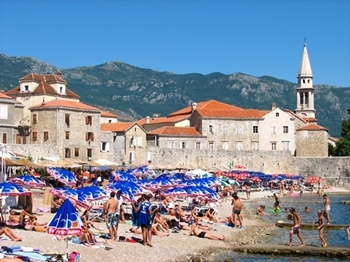 Budva is Montenegro’s main tourist centre; the busiest – and in summer the most crowded – settlement along the coast. The secret of the city’s popularity rests mainly on its beautiful, mainly sandy coastline, which caters for the would-be bathers. In addition to the splendid beaches of the “Budva Riviera”, the city also possesses a tiny, but beautiful, historic centre. Surrounded by a wall, the historic centre is located on a small peninsula which extends as a harbour-side promenade. Characterised by winding, narrow streets, and small squares, the historic-centre is rich in monuments such as the medieval Churches of St. Ivan, St. Bogorodica and St. Sava. 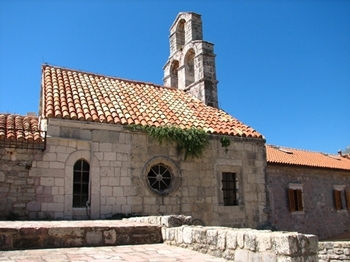 Next to the Citadel, which also dates from the Middle Ages, stands the colourful Church of St. Trojica, built in 1804. 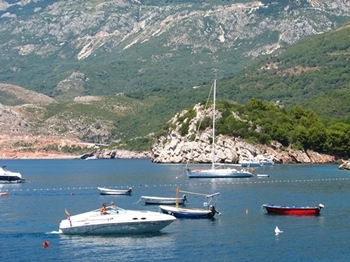 Budva is considered one of the oldest places on the Adriatic Coast. According to legend Budva was founded by Kadmo, the son of the Phoenician King Agenos, after he had been banished from Thebes. He arrived there on a bullock cart and established the town of Budva. 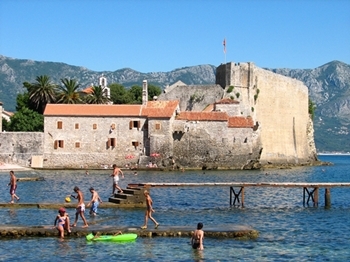 The old town of Budva lies on a small peninsula that is connected to the land by a causeway. It is surrounded with high walls built in the 15th century. Those walls represent a medieval-style fortification system, with town gates, protection walls and towers. From the urban point of view the town is laid out with narrow streets and small squares and valuable monuments from different Mediterranean cultures that all marked the development of the town Budva. The Church of St. Ivan from the 7th century with paintings and icons done by Venetian painters during the period between the 15th and 17th centuries. The church has in its possession a library and an archive with preserved valuable exhibits of old church books. The Church of St. Marija in Punta, built by the Benedictines in 840. The Church of St. Sava, built during the Nemanjić dynasty’s rule in the 14th century. It was first mentioned in 1413 in the charter of the Zeta ruler Balša III. The Church of the Holy Trinity was built in 1804. In front of the church is the grave of the writer Stefan Mitrov Ljubiša. The church is near the citadel in the old town. 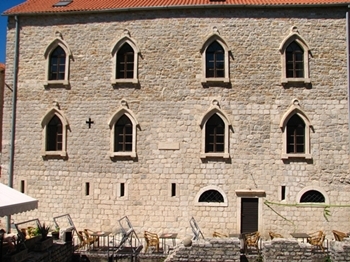 Budva Citadel, constructed for the purpose of fortifying the town in the Middle Ages. It owes its current look to the Austro-Hungarians. The Roman villa ”Villa Urbana” was found during the laying of the foundation stone for the old hotel „Avala“ (in 1938). It is one of the most important archaeological discoveries of the old town of Budva from the times of antiquity. This was a public town building of huge dimensions, with many rooms for various purposes. A special treasure within the house is the symbolic painting of the well-known legend of the origin of Budva, from the 1st or 2nd century AD. The part from Jaz to Buljarice is the realm of the most visited, largest and most beautiful Montenegrin beaches, which alternate in waves with the high limestone cliffs. Here are the towns Budva and Petrovac, and between them the hotel town Sveti Stefan, the jewel of the whole coast. Budva city Beach beach is between the Old town and the Avala hotel, and the other one between the Old town and Budva port. They are pebbly and immediately next to the ramparts of the old Town. Jaz Beach is situated in the Mrcevo field as its background with the seasonal Drenovstica river running through it. It is from both sides protected by the hills of Grbalj and Straza. The beach is 2.5km away from Budva on the way to Tivat. There are two parts of this beach, one is 500m long, and the smaller one which is used by nudists is 300m long. The beach is pebbly as is the sea bottom at its beginning, but it becomes sandy as the water gets deeper. The sand gives the water a wonderful turquoise shade. In the background of the bigger part of the beach, in the Mediterranean vegetation and greenery, there is a campsite with a capacity of 2000 sites. The beach is a protected natural heritage site. Budva Mogren I II beaches beaches stretch from cape called Mogren to the Avala Hotel. Their natural conditions make them the most attractive beaches, with a sand of medium particle size, both on the beach itself and in water. The beach is well exposed to sun and southerly wind. From backside it is protected by the hill of Spas whish is overgrown with dense pine and oak forest. The beach is a accessible by narrow path going through Avala hotel complex. 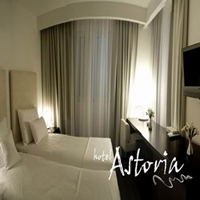 It is 150 m away from Budva´s old town. Mogren I consists of two sandy beaches 350 m long, which are connected with a tunnel. These beaches were named after the Spanis seaman Mogrini, who had a shipwreck and landed at one of them. As a sign of gratitude he built church devoted to St. Antony.